The FLOWBEC unit uses a vertical swath imagenex 837B Delta T and a vertically-mounted Simrad EK60 multi-frequency echosounder. The imagenex active sonar is used for target tracking, classification and observations of behavioural responses of fish, diving seabirds and marine mammals. The vertical swath orientation of the Imagenex gives coverage of the full water column, but with a relatively narrow horizontal band, which will not cover the full swept area of the turbine. The vertical swath and position (upstream / downstream of the turbine) means the unit can monitor the full water column. Performing deployments both adjacent to devices, and in areas free from devices yet subject to similar environmental conditions (bathymetry, substrate, tidal flow), also provides an opportunity to compare the behaviour and presence of animals between sites where the only significant change is the presence/absence of a device. 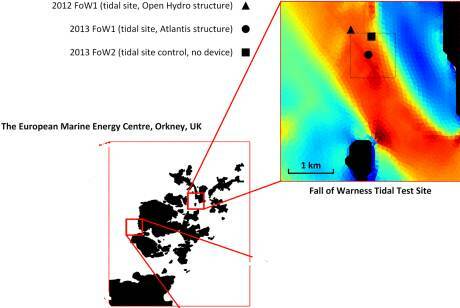 EMEC Fall of Warness FLOWBEC Platform Multi-Beam Sonar and Echosounder Data is located in United Kingdom.